Scientists are eager for a closer look at the solar system's strangest and most active volcanoes when Galileo flies by Io on October 11. October 4, 1999: Thirty years ago, before the Voyager probes visited Jupiter, if you had described Io to a literary critic it would have been declared overwrought science fiction. Jupiter's strange moon is literally bursting with volcanoes. Dozens of active vents pepper the landscape which also includes gigantic frosty plains, towering mountains and volcanic rings the size of California. 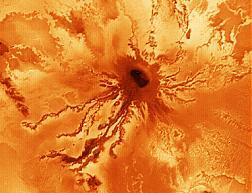 The volcanoes themselves are the hottest spots in the solar system with temperatures exceeding 1800 K (1527 C). The plumes which rise 300 km into space are so large they can be seen from Earth by the Hubble Space Telescope. Confounding common sense, these high-rising ejecta seem to be made up of, not blisteringly hot lava, but frozen sulfur dioxide. And to top it all off, Io bears a striking resemblance to a pepperoni pizza. Simply unbelievable. Right: Digital Radiance simulation of Pillan Patera just before the Galileo flyby. click for animation. Since the first volcanic plume was discovered by Voyager in 1979, Io has remained under intense scrutiny. Astronomers using ground-based telescopes can monitor large volcanic eruptions from Earth by recording outbursts of infrared emission. Such measurements combined with Voyager and Galileo data show that some volcanoes on Io have been active for at least 20 years. For a world dominated by fiery volcanoes, it's curious that Io is also very, very cold. The ground just around the volcanic vents is literally sizzling, but most of Io's surface is 150 degrees or more below 0 C. The moon's negligible atmosphere traps little of the meager heat from the distant Sun. As soon as volcanic gases spew into the air they immediately begin to freeze and condense. The plumes of Io's sizzling volcanoes are very likely made up of sulfur dioxide snow. Above: This false color infrared composite of Jupiter's moon Io was produced from images acquired in July and September, 1996 by NASA's Galileo spacecraft. The area shown is 11,420 kilometers in width. Deposits of sulfur dioxide frost appear in white and gray hues while yellowish and brownish hues are probably due to other sulfurous materials. Sulfur dioxide is normally a gas at room temperatures, but it exists on Io's surface as a frost after condensing there from the hot gases emanating from the Io volcanoes. Bright red materials (such as the prominent ring surrounding the currently erupting plume Pele) and spots with low brightness or albedo ("black" spots) mark areas of recent volcanic activity and are usually associated with high temperatures and surface changes. "Io has lots of thermal areas just like Yellowstone," says JPL's Bill Smythe. "The volcanic plumes get most of the attention but there are probably also things like fumeroles and geysers. On a previous flyby the Particles and Fields instruments saw a deficit of energetic particles over Io where gas was probably coming out of the surface -- but no plumes were seen. We call this the 'stealth plume hypothesis.' The closest Earthly analog to what's happening would be a water geyser like Old Faithful. In fact, if you put Old Faithful on Io it would be about 37 km high!" The intense volcanism on Io results from 100 meter high tides raised in its otherwise solid surface by nearby Jupiter and the other Galilean satellites. Although this process is fairly well understood, many aspects of Io's forbidding environment remains a mystery. What makes the lava around the volcanic vents so incredibly hot? What are the plumes made of? What causes the many colors of Io's mottled surface? Scientists hope that these and many other questions will finally have answers after Galileo makes two daring passes less than 620 km above Io on October 11 and November 25, 1999. In November Galileo might even pass through the plume of Pillan Patera, making it the first spacecraft ever to fly through an alien volcano. "For the October flyby we'll be targeting four major volcanoes," says JPL's Duane Bindschadler, the manager of Galileo's Science Planning and Operations Team, "Pillan Patera, Prometheus (the most prominent one on the surface), Loki, and Pele. The pictures will be great. To put this in perspective, the very best images from Voyager had 500 m resolution. We'll be getting over 100 images at least that good, and the best images will show details only 7 meters across." "But we won't just be running the camera," he continued. "Just about every instrument on the spacecraft will be turned on during the flyby. The most important ones for volcano science are probably the solid state imaging camera (SSI), the near infrared spectrometer (NIMS) and the photopolarimeter-radiometer (PPR)." Each of these instruments does something different. NIMS spectra can be used to deduce the composition of plumes, flows and other surface features. The PPR measures the polarization and intensity of sunlight and thermal radiation. This helps scientists understand what atmospheric and volcanic gases are made of and how things are heated. The SSI camera takes high resolution pictures in optical light. Each of the three can also be used like a thermometer to measure the temperature of features on Io. The NIMS and PPR instruments are better at reading the temperature of cool material like plumes and ground frost. Around hots spots warmer than 700 K, where the NIMS and PPR detectors saturate, the SSI camera can be used to estimate temperature. By using the SSI, NIMS and PPR together scientists hope to get a more complete picture of Io's volcanic activity. "The biggest mystery about Io's volcanoes is why they're so hot," says Bill Smythe, a co-investigator on JPL's NIMS team. "At 1800 K, the vents are about 1/3 the temperature of the surface of the sun! Billions of years ago basaltic lava on Earth was about that hot, but now -- thanks to mixing in subduction zones -- terrestrial basalts have a lower melting point. Lavas we see now on Earth are about 300 K cooler than they used to be. It's very surprising to see lava flows on Io as hot as these ancient flows on Earth. Why? Simply because Io's soil has been reworked many, many times, so the melting temperature should be lower for the same reason that Earth's basalts melt at a lower temperature. It's a real mystery." "Originally we thought all the lava flows were sulfurous, but sulfur vaporizes at ~700K. The 1800 K regions have to be basaltic. Now the questions is 'are any of the lava flows sulfurous?' Galileo has detected areas on Io with temperatures between 300 and 600 K. That's about right for molten sulfur. But those could also be places where tiny volcanic vents at ~1800 K are surrounded by cold ground. From a distance the average temperature would appear to be 300 - 600 K. We need higher resolution data to figure out what's going on. If we're lucky Galileo will fly right over one of these spots in October and we'll have the answer." Understanding the balance between sulfur and silicate (basaltic) volcanism is important for scientists who are trying to understand how Io's interior is heated. Sulfur has a lower melting point so it doesn't need as much energy to make lava. The basaltic flows require much more internal heat. Right: This Voyager image of Ra Patera, a large shield volcano on Io, shows colorful flows up to 200 miles long emanating from the dark central volcanic vent. Copyright Calvin J. Hamilton More information. "Another thing we'll be going for with these close-up flybys are high resolution pictures of the lava flows," continued Smythe. "We really want to know what the shapes and edges of the flows look like because that can tell us a lot about the properties of the lava. On Earth lava flows form little side lobes, or extrusions that look like arms, feet and toes. They range in size from a few centimeters to meters. From experiments on Earth, we know how to estimate the viscosity of the lava and other material properties from the shapes and sizes of the toes. That's what we want to do on Io, but the best resolution we have now is 1 km. At closest approach we'll have resolutions of only 7 meters. When we start seeing how the toes form we'll know what kind of flows these are." Some of the most exciting results from the upcoming flybys will result from great improvements in resolution. For example, the best resolution of previous NIMS data is only 60 km. "You can hide a lot in 60 km," points out Smythe. "During the closest flybys NIMS will see things just a few hundred meters across. That'll be a first." "Another thing we're hoping to get in October is a plume seen in profile as the spacecraft passes by Io and looks back over the limb," continues Smythe. "By looking at the polarization of sunlight passing through the plume with the PPR, we ought to get some really valuable information about the temperature and density of particles coming out of the vents." Here on Earth scientists will be eagerly awaiting the new data. For instance, at the University of Texas, Dr. David Goldstein and graduate students J. Victor Austin and Ju Zhang, following the pioneering work of Sue Keefer, have been working for years on computer simulations of Io's volcanic plumes. Using a technique called Monte Carlo direct simulation, they send computerized test particles blasting out of a model volcanic vent. The University of Texas program tracks the motion of ejected molecules taking into account intermolecular collisions, energy input from the Io torus, and energy lost to infrared radiation. By varying the size of the vent, the temperature and velocity of the ejected gas, and the temperature of the surrounding terrain they can match the appearance of their computerized plumes with the ones photographed by NASA space probes. Sometimes this leads to new insights about the fluid dynamics and physics of Io's volcanoes. "The upcoming flybys could substantially improve our models by providing better boundary conditions," says Goldstein. "We need to know lots of things. What are the particle velocities and temperatures coming out of the volcanic vents? How do the molecules interact with the surface? Do they stick immediately or do they bounce? etc..."
"Right now when we look at a photograph of a plume, we really are not certain what we're seeing. It might be gas, it might be dust entrained in the gas, or gas that has condensed out to form ice crystals. We assume that whatever it is traces volcanic gas but we can't be sure. Hopefully the flybys will resolve some of these issues." In one of the University of Texas sample models, pictured right, gas erupts from a vent at 2.7 times the velocity of sound into Io's tenuous atmosphere. The ejecta soar to a height of about 120 km. Much of the material lands about 150 km away where it hits the ground and bounces. Just before it hits the surface, the gas passes through a shock wave and heats up to 200 - 300 K.
"One of the most important features of this model is the canopy shock," points out Victor Austin. "It's where the gas rises to its apex and then falls back on itself. One way to think of the shock is to imagine a running water hose held straight up in the air. The water decelerates due to gravity and then comes back down. The same thing happens to a volcanic plume. It rises into the atmosphere and then gravity pulls it back. On Io the rising gaseous 'fluid' is supersonic so it forms a shock near the turnaround point." "This is where the Io flybys might confirm some of our results. Gas cools very quickly after it passes through the shock, so it's possible that a layer of SO2 snow will form in the postshock region. Vertically the shock is very thin, so the layer of ice crystals is probably going to be thin, too. That's something we might see in the high resolution Galileo images." "Another thing," said Goldstein, "many of our simulations show that warm material from the plume crashes down about 150 km from the vent. We think this might explain the dark rings we see in some of the spacecraft images (see left). These could be 'scouring rings' -- places where the SO2 frost is worn down to dirt and rock. Victor's calculations show that these rings themselves are wide but the edges are sharp. If we can see those edges in the close-up photos, it would help confirm our results. Some of the models also show a secondary scouring ring much further from the vent. We'll be looking for those in the new images, too. Scouring is one possibility, but the dark coloration may also simply be due to deposition of a different colored material coming out of the vent." Whatever the upcoming flybys reveal, the data are bound to improve our understanding of Io's volcanoes. "The programs we're running are unique," says Goldstein, "and we're looking forward to running our code with the very latest data." JPL manages Galileo for NASA' s Office of Space Science, Washington, D.C. JPL is a division of the California Institute of Technology, Pasadena, CA. Sulfuric Acid Discovered on Europa -- September 30, 1999. Sulfur from Io's fiery volcanoes may be responsible for a battery acid chemical on Europa with implications for astrobiology. Io or Bust -- September 16, 1999. Galileo braves extreme radiation as it plunges toward a close encounter with Io's volcanoes. Divining Water on Europa -- September 9, 1999. As circumstantial evidence for an underground ocean mounts, JPL scientists try an ingenious experiment to look for hexagonal ice crystals on the surface of Europa. Taking the Scenic Route to Io -- June 30, 1999. What's happening to the small craters on Callisto? That's the mystery scientists were contemplating as Galileo zoomed past Jupiter's pockmarked moon this morning in an orbit-changing maneuver designed to bring the spacecraft closer to volcanic Io. Turn Left at Callisto -- May 5, 1999. Galileo heads for a daring encounter with Io's volcanoes. Galileo buzzes Europa -- Feb. 2, 1999. Galileo executes a close flyby of Europa for the last time during the current mission. The Frosty Plains of Europa -- Dec. 3, 1998. As Galileo returns new images of Europa, NASA scientists prepare to study samples from a potentially similar environment here on Earth. Callisto makes a big splash -- Oct. 22, 1998. Scientists may have discovered a salty ocean and a possible ingredient for life on Jupiter's moon. Galileo takes a close look at icy Europa -- Oct 2, 1998. The spacecraft flew within 2300 miles of the mysterious satellite last weekend. Clues to possible life on Europa may lie buried in Antarctic ice -- Mar. 5, 1998. Exotic microbial forms turn up in ice above Antarctica's Lake Vostok.